Between 1968 and 1972 Creedence Clearwater Revival was the most successful rock band in the history of American music “bigger than the Beatles”! They released 15 singles of which 12 went into the top 20. In 1969 no other group could compete. They had a number 1 and 9 other hits in England. After seven studio albums CCR were no more and John Fogerty went on alone to produce 9 of his own studio albums from which 26 singles were released. However, their music lives on. 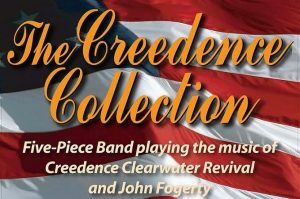 The Creedence Collection was born out of a Hull band, Mean Eyed Cat, famous on the local scene for playing their own unique swamp/country/ bluegrass versions of well- known rock and pop tunes. The request for a Creedence song was always well received and realising there was a taste for Creedence and Fogerty out there, The Creedence Collection was formed. Error: Error validating access token: Session has expired on Saturday, 23-Mar-19 02:32:21 PDT. The current time is Thursday, 25-Apr-19 18:50:04 PDT.